The locality is especially interesting and also the specimen. 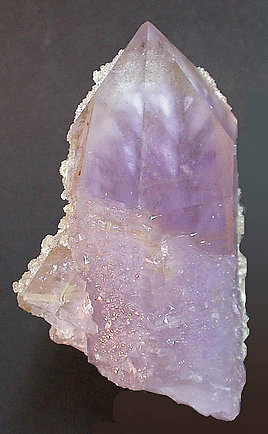 It forms a clear, sharp scepter with inner zones of different intensity of color and attractive inclusions. 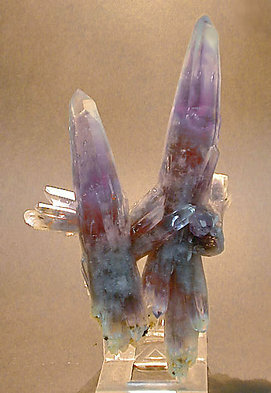 Group of transparent and bright crystals, some with a good length. 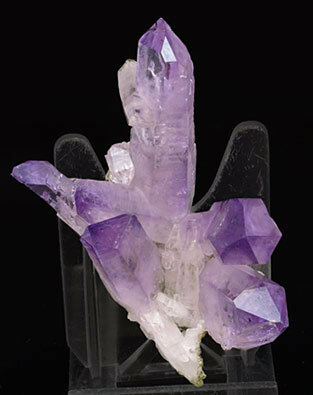 Color zoning is present in some crystals and the color more dense and uniform in others, and with phantom growths. One of those not plentiful non-Spanish samples from the Daunis collection. 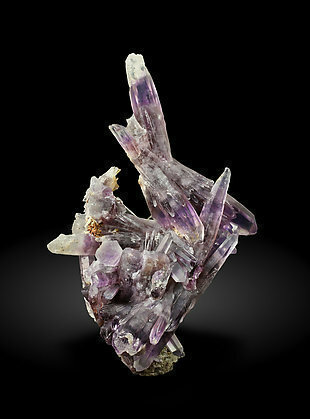 Stalactitic growth of Quartz (amethyst variety) crystals with practically no prisms. 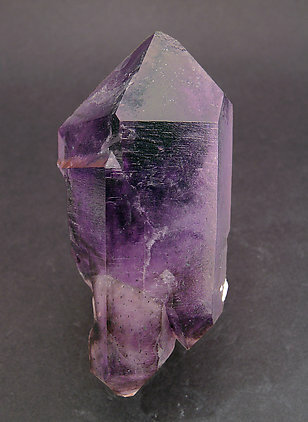 They have a very deep color, an intense luster and are very rich in inclusions. 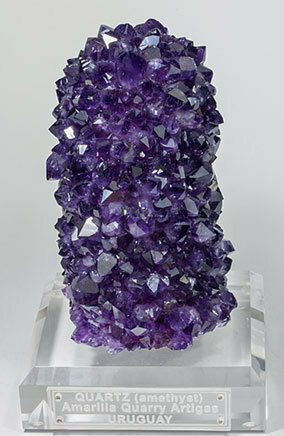 Amatitlan gave the largest doubly terminated Amethyst crystals in the world. Unfortunately most of them were damaged with broken or significant dings at the top of the crystals. Just a few specimen were saved in good shape. Again, Martín was in the right place at the right time and luckily he got a very esthetic one without significant damage. 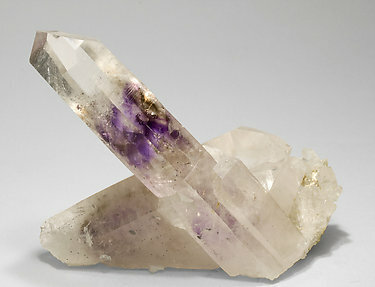 Plus this specimen has two main doubly terminated crystals joined by other smaller crystals. As you can see in the photo the specimen looks great! 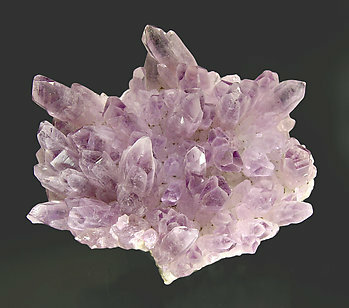 Fine aggregate on matrix of very transparent crystals with an attractive pale lilac color and the slightly curved shape typical of the best samples from Baia Sprie. 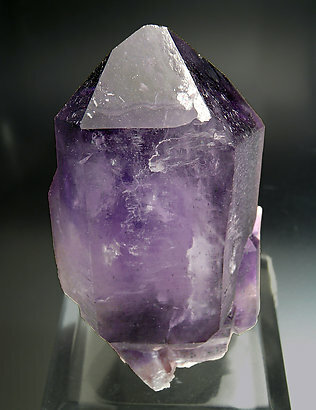 Crystals have a deeper color than usual for the locality and the three faces of the dominant rhombohedron are much larger than those of the other rhombohedron. 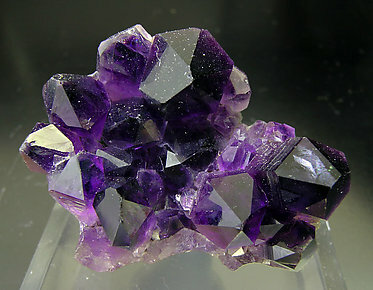 Perimorph growth of very sharp and bright crystals with a very deep violet color, very rich with oxide inclusions and with recrystallized hematoid Quartz microcrystals on the edges. 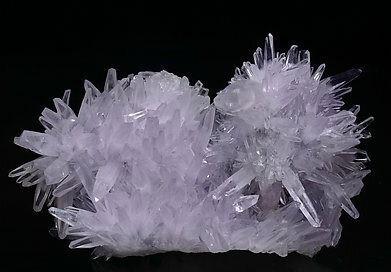 The amethyst grew coating a group of Calcite crystals, subsequently dissolved and completely missing, that left a big cavity with geometrical forms. The quality of its color is extraordinary. 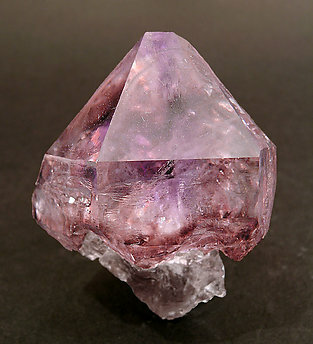 Crystals have different intensities of color on the prism and the rhombohedron, it is more intense on the terminations. 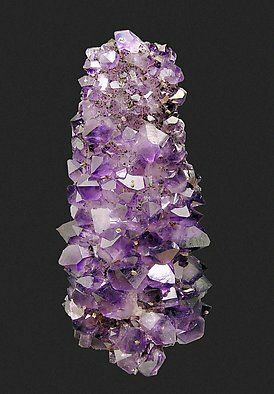 The group is a stalagmite which once covered a hexagonal crystal of Calcite, now gone, but it left a mold in the center of the specimen. We note the precision of the quarry’s name, until now very difficult to determine on Uruguayan specimen. Stalagmitic growth of crystals of dipyramidal habit and a very poorly developed prism. Of excellent color and luster, they form a very interesting esthetic piece. This sample is from a recent find in March 2009. 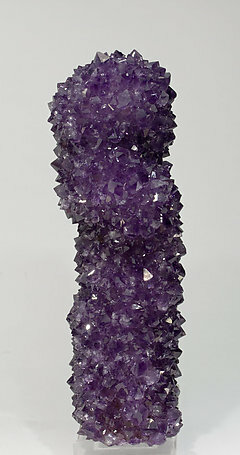 Stalactitic growth of crystals of deep violet color and intense luster in which predominate their terminal faces due to the scanty development of the prismatic forms. 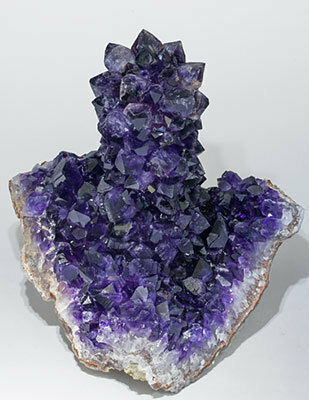 Stalagmitic growth of small crystals of amethyst with a modestly developed prism, a very deep violet color and intense luster, standing on a base of crystals of the same mineral and all in basalt matrix. Parallel growth of a brilliant doubly terminated crystal group with a pale but uniform color. 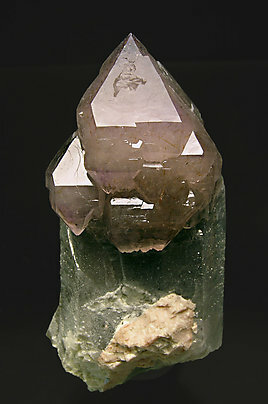 The group forms a scepter on a deep smoky Quartz crystal. 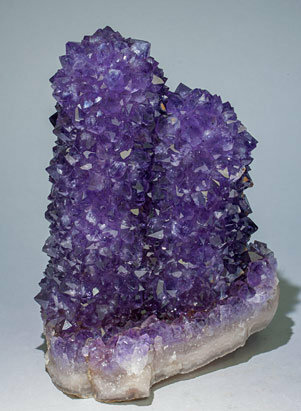 Parallel growth of amethyst crystals, with a second generation of small Quartz crystals, some of them doubly terminated, which grew perpendicular to the specimen main axis. Color is more intense in terminations. A very curious specimen for the locality. 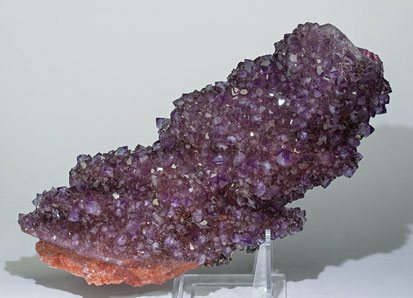 This specimen is from the AVE (Spanish High Speed Train) quarry works where actually it is quite impossible to obtain quality specimens. Beautiful miniature. 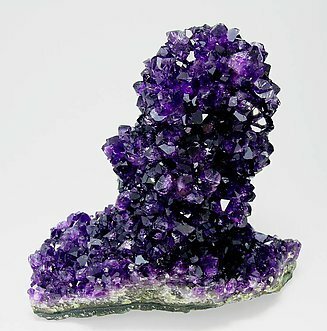 It is a group of crystals having an extraordinary deep color. Faces and edges are so sharp that they seem polished. The locality itself is very original. 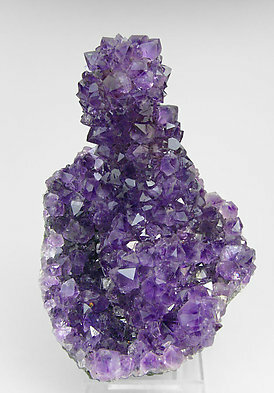 Single crystal, recrystallized at the bottom, of brilliant amethyst with a nice deeply colored phantom inside. Its rear is covered by minor orange Fluorapophyllite-(K). We will provide a copy of the analysis of it to the customer. 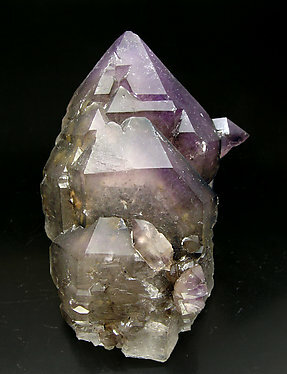 Transparent, colorless and very neat crystals with very well marked phantom growth of deep amethyst color. The base of the sample is recrystallized and the main crystal has a small geometrical indentation on the faces of the rhombohedron. 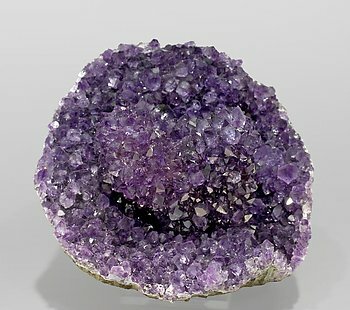 A nice miniature, very esthetic, forms a crown of crystals of excellent transparency, luster and color typical of the samples of this locality. 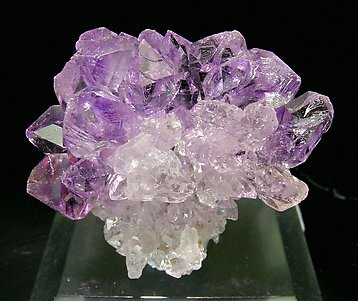 The crown of violet crystals strongly contrasts with a central nucleus of clearer crystals practically uncolored. 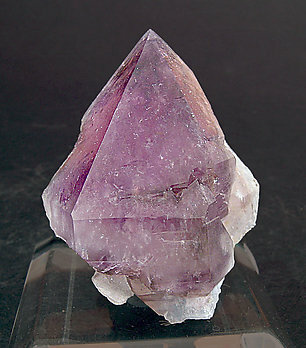 The most notable thing about these crystals is the way the rhombohedral faces of the termination are much larger than the prism faces. 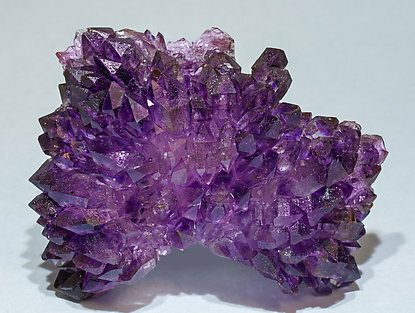 The color is intense and the coloring is not evenly distributed within the crystals. The rear has re-crystallized.